Shapes were produced using the slip-moulding process, where liquid clay (slip) was poured into moulds. This allowed for economical and consistent manufacture on a factory production line basis. 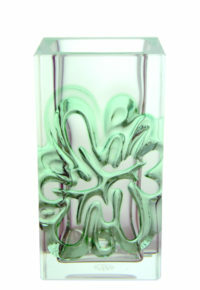 Different vases make up the majority of the shapes in the range. All are clean-lined and, except for one, bear no surface embellishment, allowing the glazes to be shown off at their best. 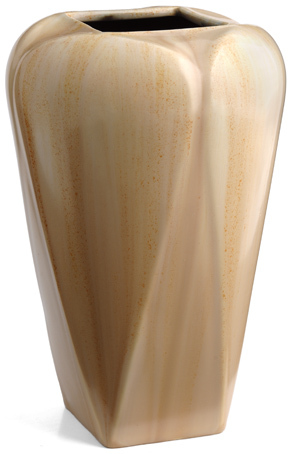 Vase forms are typically traditional forms such as the baluster or tapered cylinder, or were inspired by classic Chinese forms such as the ginger jar. This inspiration and their clean lines meant that they would have fitted into an Art Deco interior seamlessly. 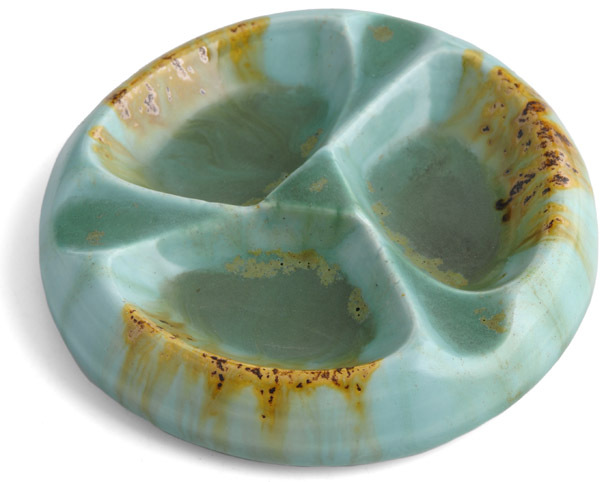 Chinese ceramics were an inspiration for both art potters and Art Deco designers. 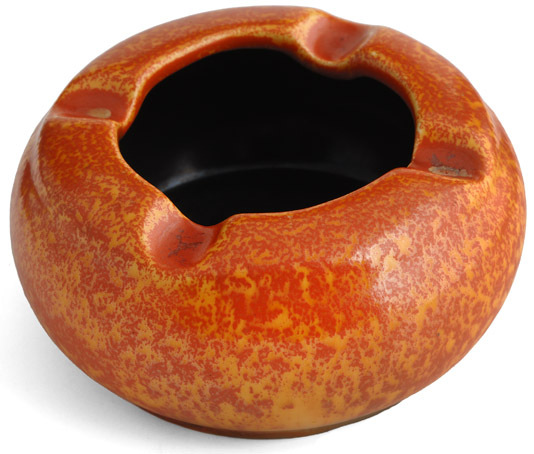 Bowls were also produced, as were smoking accessories such as ashtrays, which tend to be the most common Ricardia forms found. 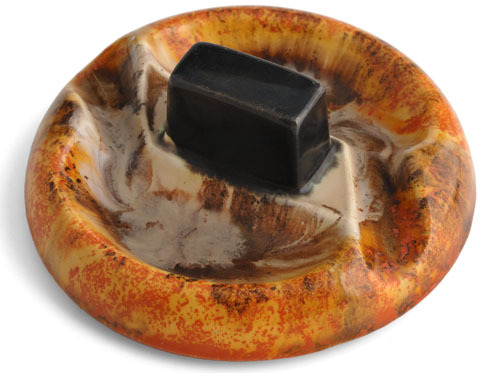 Small, simple and economical to mould, these were typically given away as promotional items to agents, retailers, distributors, and the public at a time when smoking was both popular and deemed healthy. These are more strongly Art Deco in style, but the moulded angles are more than decorative and act as cigarette rests and wells for ash. Although not shown here, bookends, paperweights and memo pads were also apparently produced and given away as promotional items. 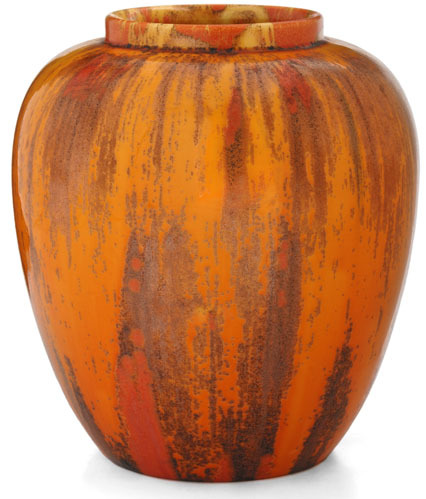 A classic Chinese form, the large surface area allows the full effects of the glazes to be shown at their best. This is one of the most dramatic, visually appealing and desirable forms. 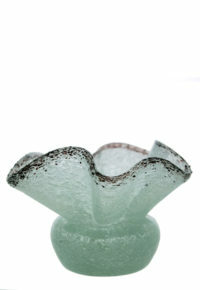 This form has a small neck, and a few examples have been found with a domed lid with matching glazes. Lidded examples were seemingly not given a different shape number, and it is impossible to know how many of these were originally produced with lids which have been subsequently lost or broken. One of the more common shapes. Approx. 7.25in (18.3cm) high. A simple form, this may have been produced postwar as examples have been found with simpler glossy glazes typical of the 1950s & 60s and printed marks more in the style of those found in the postwar period. One of the more common shapes. Approx. 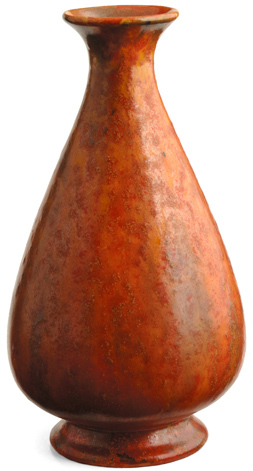 5.25in (13.5cm) high. A practical, appealing and classic form. It is hard to find today, meaning many may have been broken through use. Approx 5in (12.5cm) high. A classic form, with its origins in ancient Chinese ceramics. 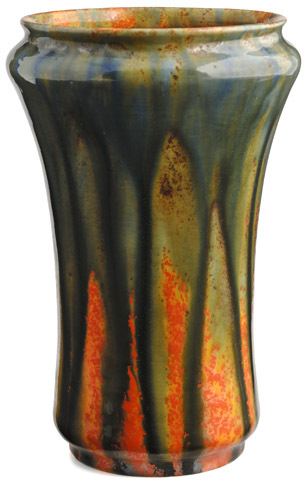 When found decorated with complex, dripping glazes, examples often echo pieces by Royal Doulton with Oriental-inspired glazes, or works by other glaze-focused art potteries such as Ruskin. 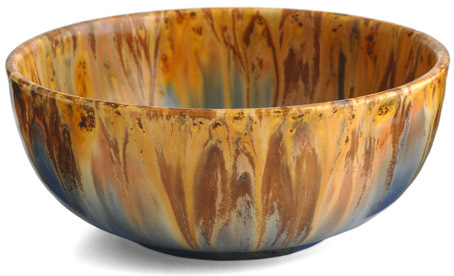 This simple form allows the random and unique pattern formed by the dripping glazes on each piece to be shown off at its best in the interior. The bottoms of interiors are often heavily scratched through use. Approx. 6in (19cm) diam. A smaller version of shape number 13. This appears to be scarcer than the larger version. Approx. 5.5in (14cm) high. 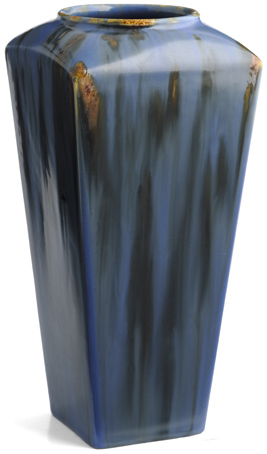 A square section, tapering vase with gently curved shoulders and a low collar neck, this elegant Art Deco form was perhaps inspired by ancient Chinese ceramics. The corners are prone to damage, so must be checked carefully. Approx. 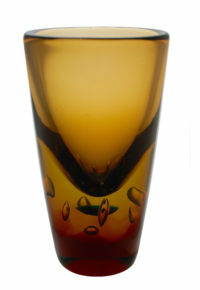 7.75in (19.5cm) high. A smaller version is numbered 9. 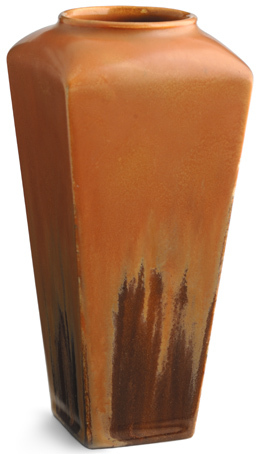 This vase tapers from a round section top to a square section base. Its defining feature is the series of four moulded inverted teardrops, which look like stylised leaves and are reminiscent of some forms by American Arts & Crafts potteries such as Teco. 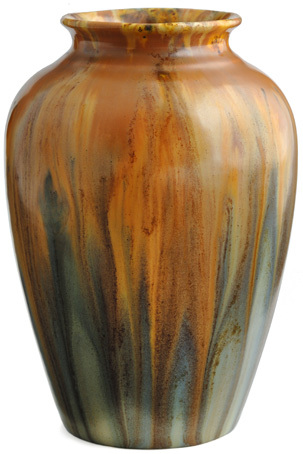 This is the only vase with a surface decorated in addition to the glaze. Approx. 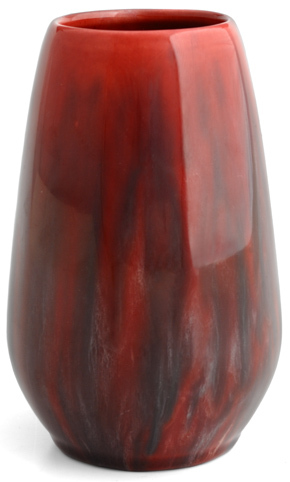 7.5in (19cm) high. A tapering form with a slightly waisted centre and collar neck. 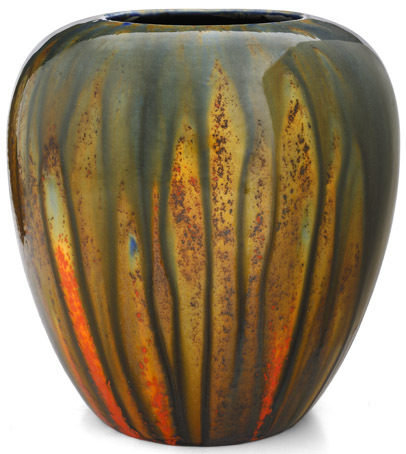 Due to the large opening, the interiors are usually decorated in the same glaze as the exterior, rather than the standard glossy black glaze. An example has been found bearing a badly painted number which may be a 4 or a 6. Approx 6.1in (15.5cm) high. 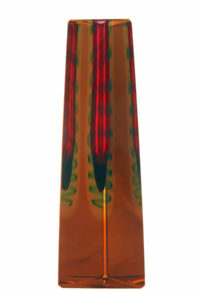 A solid moulded form, the geometric angles and forms typical of the Art Deco style are functional as well as decorative, and alternate between cigarette rests and wells for ash. These practical, easy to produce shapes are amongst the more common pieces of Ricardia found. Some bear the names of retailers, distributors, or agents on the base. 4in (10cm) diam. A solid moulded form, the central rectangle acts as a holder for a matchbox, fitting inside the sleeve and pushing the sliding tray upwards to allow easy access to the matches inside. Less commonly found than the ashtray above, these are still amongst the more common Ricardia items found. Approx. 4.2in (10.5cm) diam. A simple, practical and undemanding shape. Despite the wide opening, the interiors are usually glazed in the standard glossy black glaze as ash and cigarette butts would negate the need for the interior to bear the same glaze as the exterior. These were presumably inexpensive and mass-produced items used as promotions. Many bear the names of retailers, distributors, or agents. Approx. 3.75in (9.5cm) diam. 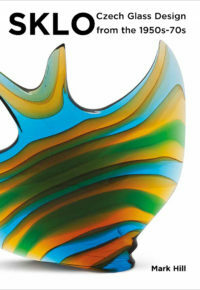 One of the more interesting and innovative forms from the Ricardia range. The large box would have contained cigarettes, and the angled and recessed areas on the lid acted alternately as cigarette rests and wells for ash. 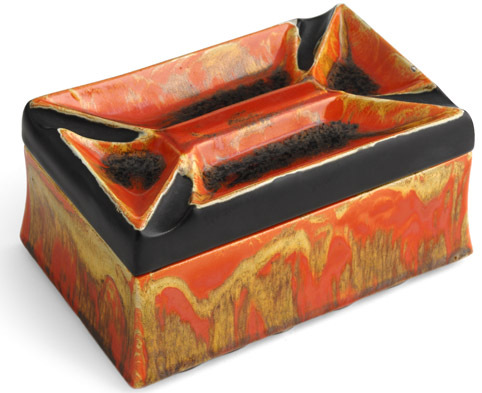 On the best examples, the recessed areas are strikingly decorated using a black glaze that is also used on the angled sides of the lid, as shown here. The sides of the box are thin and very fragile, so are often cracked or chipped. Perhaps the rarest shape is the ‘Ricardia Medal’, an 8in (20cm) diameter embossed and glazed plate produced in-house and awarded to long-standing employees, or those that achieved a certain goal. Introduced by company director Edward Reginald Geoffrey Corn (1899-1987), known in the factory as ‘Mr Geoff’, it was awarded into the 1950s and recipients also had the letters ‘RM’ added after their name on company documents. 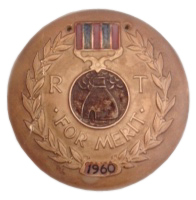 This disc, dated 1960, is presumed to be a Ricardia Medal. Although normally only awarded to company employees, the medal shown here was presented by John Corn, son of Mr Geoff, to his own son Philip for successfully swimming a certain distance in the coastal waters at Penycwm, Pembrokeshire. Image courtesy of Tim Corn. 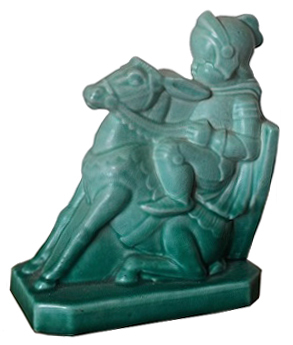 Although it may not have been a part of the Ricardia range of art pottery, examples of this figural soap have been found with similar glazes and RICHARDS TILES printed marks on the base. It is possible that it was offered as a stand-alone part of Richards’ ‘Recesso’ range of bathroom fittings. Examples found today are usually damaged, due to the functional nature of the piece. Image with thanks to Don Patterson of China Rose Antiques. 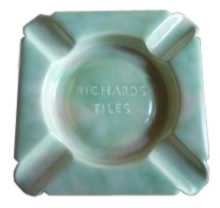 The moulded wording and very simple, standard design may indicate that this ashtray was produced to advertise Richards Tiles rather than having been intended to be a part of the Ricardia artware range. Although this green glaze is known in Ricardia Ware, it was also used on household tiles that were mass-produced and enormously popular during the period. The base is marked RICHARDS. This very rare, highly-stylised, hollow, slip-moulded design was presumably produced as part of the Ricardia artware range. 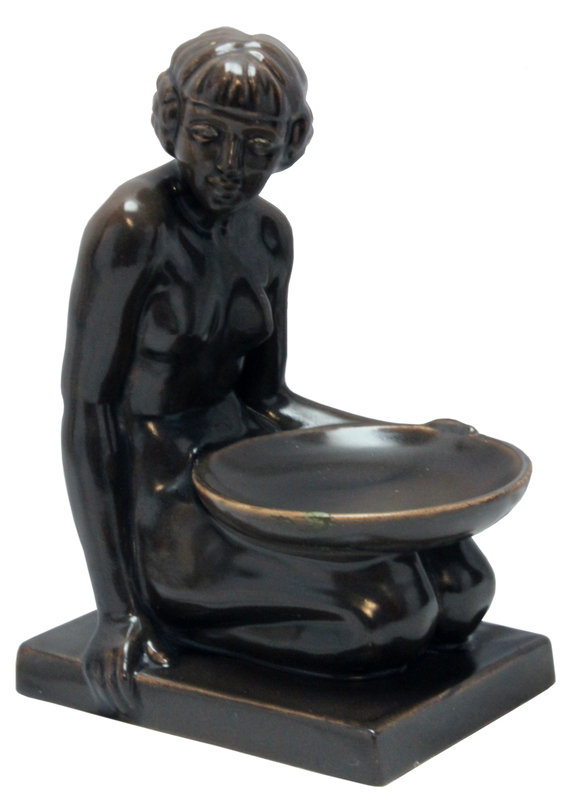 Figurines such as this were popular during the Art Deco period, being made from plaster, ceramic or metal. Although many were by anonymous makers, similar examples by known makers include the designs of John Skeaping for Wedgwood and Harold & Phoebe Stabler for Carter, Stabler & Adams (Poole Pottery). The choice of a plump baby as a knight echoes the designs of Mabel Lucie Attwell, particularly the figurines and teawares produced by Shelley. The base is marked RICHARDS. Image courtesy of Tim Corn. This page is a work in progress. If you have any more information about Ricardia shapes, or know of the existence of other shapes not listed here, please contact me by clicking here. Unless otherwise stated, all photographs by Graham Rae and copyright Mark Hill Publishing Ltd.